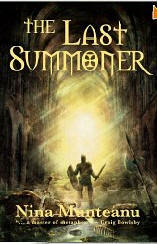 The Last Summoner is a unique story melding Germany of the 15th century and modern France, even if a different France from what we would recognize. The story centered around the very real and pivotal Battle of Grunwald in which a coalition of Polish and Lithuanian forces defeated the monastic Teutonic Knights. The book takes a look at the young 14-year-old baroness of Grunwald, someone not quite human, and how she attempts to right a wrong and get history back on track. The author is a good writer, and her wordsmithing is excellent. The story starts out slowly and is a little bloated for the first quarter of the book, but once it gets going, the pace picks up and draws in the reader. A few of the Paris scenes could be tightened up a bit, in my opinion, but overall, the bulk of the story hits just the right pacing. Characterization is uniformly excellent. I enjoyed pretty much all of the characters and could understand the actions they take. The historical research was outstanding. Given that this is fiction, and that two settings did not follow history as we know it, never-the-less, each event was either very accurate to our known history or made logical sense in the other settings. I am not a huge fan of alternative history books, but in this one, I was extremely caught up in the final section of the book, and I had to contemplate how the world might be different with only a few changes to our history. While I was familiar with most of the historical background of the book, I was unaware of some facts, such as the Tartars taking part in the Battle of Grunwald. I thought this was a mistake made on the part of the author and went to confirm that, but in fact, the author was correct. Editing was satisfactory, although it began to slip a little towards the end of the book, mostly with incorrect word usage (such as "right" instead of "write.") The conversion to a mobi file had a few problems with hyphens, but that did not detract from the book's overall enjoyment factor. I had a minor problem on how easy it was to stop the major antagonist at each confrontation, but my major problem with the book was the use of foreign languages. Significant use was made of both French and German. I understand enough German to make out most of what was written, but for the French, I must have missed over half of it. Reading it on a Kindle made it impossible for me to merely copy and paste into a translation program, and even if it would have been easy, I am not sure how much I would want to interrupt the flow to stop reading and get the translation. When writing a book in English, the occasional "merde" or the like is acceptable, in my opinion. But when the foreign language text used needs a translation, I think that has gone too far. Overall, I think this is a clever, well-written book. I would recommend it without hesitation.